Thinking about a career in product management and want to break in? Or are you a PM who’s looking to meet and network amongst your peers? 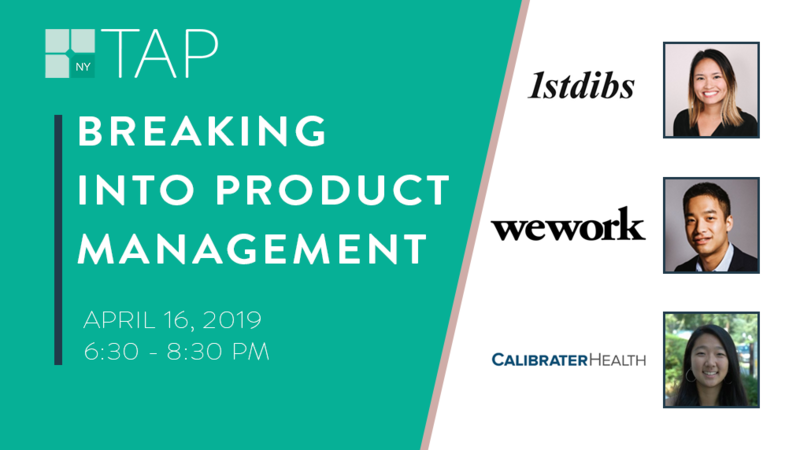 Join us for a special panel as we welcome three product managers from leading NYC tech companies to share their thoughts on the field, applicable skills, and job markets. This will be followed by a brief Q&A session, and we’ll wrap up with some time to network among the attendees. Charlie Huang is a Senior Product Manager at WeWork, where he has worked for the past year. Prior to WeWork, Charlie worked across a variety of tech companies, including Spotify and Google. He graduated from MIT with a B.S. in Management Science. Jess Wu is a Product Manager at Calibrater Health, a start-up that builds customer service software for healthcare, combining patient surveys with automated feedback management to improve the efficiency of healthcare teams and businesses. Jess graduated from Tufts University with a B.S. in Mechanical Engineering.